In our readings today, we hear how sin entered the world, and with it, shame, guilt and alienation. And yet, God offered ultimate victory over sin. In our first reading (Genesis 3:9-15), we hear the account of Adam and Eve's encounter with God after their great sin. Despite their disobedience, God searched for them, did not abandon them. They suffered the consequences of their actions, but God offered ultimate victory over the evil one through Eve's offspring - "he will strike at your head, while you strike at his heel." After the man, Adam, had eaten of the tree, the LORD God called to the man and asked him, "Where are you?" He answered, "I heard you in the garden; but I was afraid, because I was naked, so I hid myself." Then he asked, "Who told you that you were naked? You have eaten, then, from the tree of which I had forbidden you to eat!" The man replied, "The woman whom you put here with me - she gave me fruit from the tree, and so I ate it." The LORD God then asked the woman, "Why did you do such a thing?" 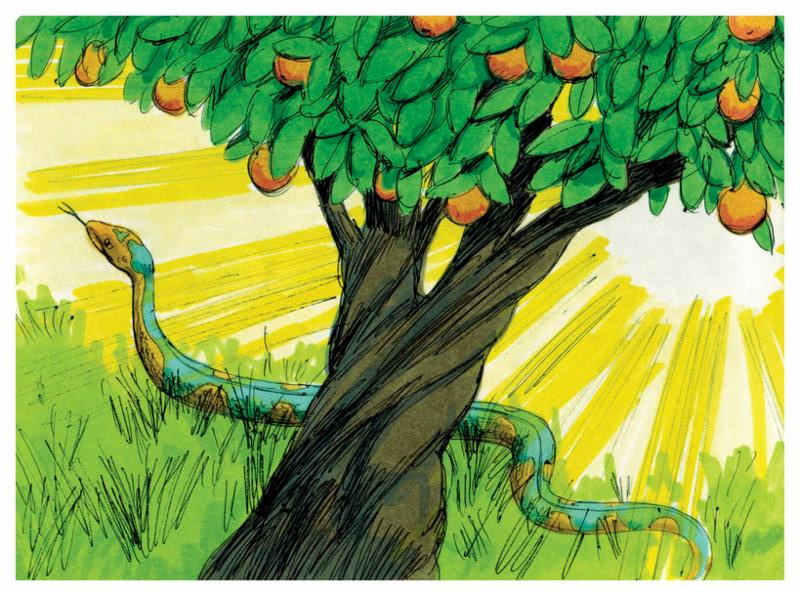 The woman answered, "The serpent tricked me into it, so I ate it." Then the LORD God said to the serpent: "Because you have done this, you shall be banned from all the animals and from all the wild creatures; on your belly shall you crawl, and dirt shall you eat all the days of your life. I will put enmity between you and the woman, and between your offspring and hers; he will strike at your head, while you strike at his heel." In our Gospel reading (Mark 3:20-35), Jesus went home with his disciples and the crowds were unrelenting. His relatives thought he had gone mad and the scribes accused him of being with Satan because he cast out demons. It is precisely this mastery over demons that corresponds to Eve's offspring crushing the head of the serpent. Jesus came home with his disciples. Again the crowd gathered, making it impossible for them even to eat. When his relatives heard of this they set out to seize him, for they said, "He is out of his mind." The scribes who had come from Jerusalem said, "He is possessed by Beelzebul," and "By the prince of demons he drives out demons." Summoning them, he began to speak to them in parables, "How can Satan drive out Satan? If a kingdom is divided against itself, that kingdom cannot stand. And if a house is divided against itself, that house will not be able to stand. And if Satan has risen up against himself and is divided, he cannot stand; that is the end of him. But no one can enter a strong man's house to plunder his property unless he first ties up the strong man. Then he can plunder the house. Amen, I say to you, all sins and all blasphemies that people utter will be forgiven them. But whoever blasphemes against the Holy Spirit will never have forgiveness, but is guilty of an everlasting sin." For they had said, "He has an unclean spirit." His mother and his brothers arrived. Standing outside they sent word to him and called him. A crowd seated around him told him, "Your mother and your brothers and your sisters are outside asking for you." But he said to them in reply, "Who are my mother and my brothers?" And looking around at those seated in the circle he said, "Here are my mother and my brothers. For whoever does the will of God is my brother and sister and mother." In our Epistle reading (2 Corinthians 4:13-51), St. Paul represents the struggles of this life as transitory and keeps his eye on the ultimate victory over death, through Jesus, and eternal life with God in heaven. Brothers and sisters: Since we have the same spirit of faith, according to what is written, I believed, therefore I spoke, we too believe and therefore we speak, knowing that the one who raised the Lord Jesus will raise us also with Jesus and place us with you in his presence. Everything indeed is for you, so that the grace bestowed in abundance on more and more people may cause the thanksgiving to overflow for the glory of God. Therefore, we are not discouraged; rather, although our outer self is wasting away, our inner self is being renewed day by day. For this momentary light affliction is producing for us an eternal weight of glory beyond all comparison, as we look not to what is seen but to that is unseen; for what is seen is transitory, but what is unseen is eternal. For we know that if our earthly dwelling, a tent, should be destroyed, we have a building from God, a dwelling not made with hands, eternal in heaven. Many scholars believe that the reference in Genesis 3:15 of the offspring of Eve striking at the head of the serpent (Satan) is a reference to Jesus, as the offspring of Mary. It is why we often see Mary depicted with her heel on the head of the serpent. It gives us hope to know that no matter what our sin, God will seek us out -"Where are you?" and, while not insulating us from the consequences of our sin, will offer us forgiveness and redemption. This is the hope of which Paul speaks in his letter to the Corinthians. It is our hope today.